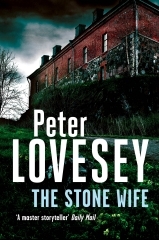 The Stone Wife was published in 2014 in the UK by Sphere and in the USA by Soho Crime. Just as the bidding gets exciting in a Bath auction house, three armed men stage a hold-up and attempt to steal Lot 129, a medieval carving of the Wife of Bath. The highest bidder, appalled to have the prize snatched away, tries to stop them and is shot dead. 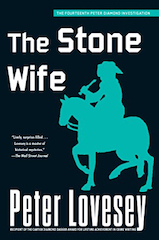 Peter Diamond, head of the murder squad, soon finds himself sharing his office with the stone wife – until he is ejected. To his extreme annoyance, the lump of stone appears to exert a malign influence over him and his investigation. Refusing to be beaten, he rallies his team. The case demands someone goes undercover. The dangerous mission falls to Sergeant Ingeborg Smith, reverting to her journalistic persona to get the confidence of a wealthy criminal through his pop star girlfriend, Soon, murder makes a reappearance.